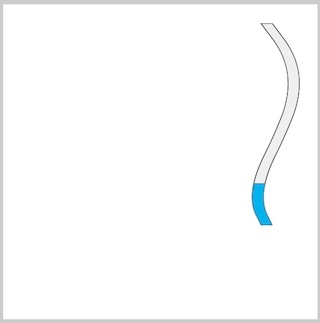 De Casteljau subdivision is a procedure by which a Bezier curve is defined. 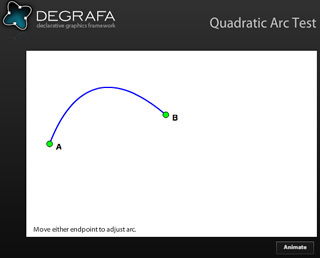 It is also used to subdivide a quadratic Bezier curve into two distinct quadratic Beziers representing individual segments of the original curve. 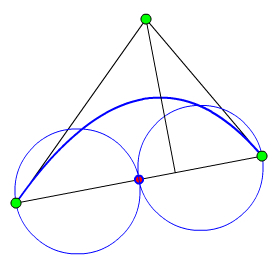 The first Bezier segment is in the interval [0,t] and the second lies in [t,1] for t in (0,1). Some 3D graphics packages use the term refinement to describe to the process of subdividing or splitting a curve into two equivalent segments at some interior point. Refinement is also used to describe a process of extracting the coefficients of an equivalent-degree curve at two interior points. 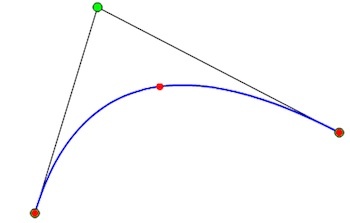 In this context, refining a quadratic Bezier curve produces another quadratic Bezier that represents the original curve in the interval [t1,t2] where t1 < t2 and both t1, t21 are in [0,1]. This is an infrequent operation, although I recently used it in the organic scroller, the boundary of which is a quadratic Bezier spline. The process may also be used to extrude any segment of a path comprised of quadratic Beziers (such as a circle approximation). A screen shot of the demo program is shown below. Not much to the demo. The blue curve is the quad. 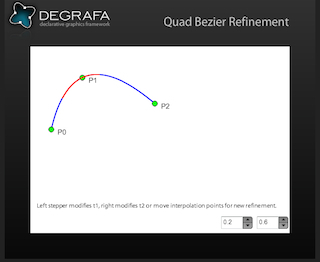 Bezier that interpolates the three points, P0, P1, and P2 with chord-length parameterization. 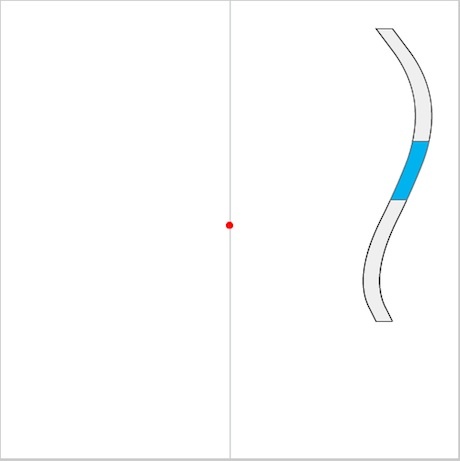 The red curve is drawn from coefficients returned from the quadRefine() method of the BezierUtils class. Above, the red curve illustrates refining the original quad in the interval [0.2, 0.6]. 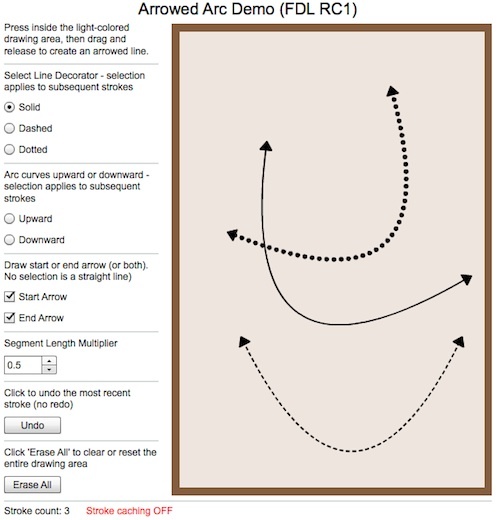 Drag the points to see how the refinement is modified. Adjust the stepper thingies to modify the interval. [t1,t2] can be extended to a maximum of [0.1,0.9] in increments of 0.1. Note that t2 must be strictly greater than t1. Code has been committed to the Origin branch.